If the town is flattish then the problem is undoubtedly greatly diminished and Lucca has been making considerable efforts since last year to improve accessibility, especially for wheelchair users. Typical examples include sloping down pavements to pedestrian crossings and more ramps to access public buildings as at San Giovanni. I’ve often wondered what those dimpled tiles used on slopes to pedestrian crossings are and thought they may have served some purpose to avoid slipping in icy or wet weather. Not at all! Returning from a concert the other night we walked from near piazza san Martino to Porta Elisa and noticed steel markings of various designs embedded in the pavement, some for a considerable distance. When we observed a partially sighted person using the grooves in these steel markings as a guide for his special cane we realised that both these grooves and the dimpled tiles we often saw were, in fact, a form of street braille language (“plastic pavements”) to give information to registered blind persons as to such features as street crossings, access to buildings, danger areas and so on. The system was perfected by an Italian company and goes by the name of LOGES which stands for “Linea di Orientamento, Guida e Sicurezza” (line of orientation, guide and safety) Lucca is hard at work, together with several other Italian cities within the European union, to make easily accessible routes for partially sighted persons within its beautiful walled city. The route from the station to the cathedral is at present under construction. The system is based on two codes: a base code and four second level codes. The first code deal with direction and places where to stop at road crossings. The second level codes have extra information including showing access to public buildings, difficult intersections, sudden changes in street level etc. Fortunately, for the present, both my wife and I have reasonable vision but we regrettably have presentiments of what could easily happen to us in the foreseeable (forgive the pun…) future. There is a history of glaucoma in my family and my mother suffered months of blindness before she sadly died in 2009. (In fact, she’d started learning braille). My wife suffers from incipient macular degeneration and is taking appropriate steps for it. How does the street braille system work? Here are some examples from a factory making the tiles, which can be either in stone, steel or that wonderfully durable terracotta the Italians are so good at making since Roman times. Help doesn’t stop there for visually impaired people. There’s a Lucca project called “The Walls for all”, relating to its wonderful tree-lined walls, funded by the Fondazione Banca Del Monte di Lucca. It’s a collaboration between Pisa University’s Engineering Department, the Institute of Science and Technology (ISTI), Pisa’s research centre CNR and Lucca’s section of the National Union of the Blind and Partially Sighted (UIC). The objective is to allow people with visual impairments to move independently in urban environments. Lucca’s walls were chosen as a test site, and after a trial on the San Donato Bulwark in 2011, a hi-tech path of about 1.5 km from San Salvatore bulwark to Santa Maria bulwark, is currently under construction. The system consists of a smart white cane (“Smart Dog”) built in fiberglass and equipped with appropriate electronics, from a location identified by a pair of buried cables connected to a transmitter and an Android smartphone on which there’s an application which communicates via Bluetooth with the smart stick. Thanks to this equipment partially sighted and blind people can move independently via a vibro-tactile signal generated from the “Smart Dog” when the receiver, placed at the lower end of the stick, is located within a distance of some tens of cm from the underground cables transmitting a 10 kHz signal. The user’s location is also determined using GPS technology. Eventually, added information will be added e.g. historical information about the sites on the wall, places to eat, public facilities etc. When we were irresponsible teenagers we pretended to “see” what it was like to be a blind person and we chose one of our mates as a guinea pig, fitted him up with a pair of dark glasses and gave him a white stick. We were both shocked at the helplessness of our friend but were also encouraged by the amazing helpfulness of strangers. Of course, we felt somewhat guilty afterwards about the deception we’d tried on the public but it is a fantastic thought that very soon there could be in place the technology to allow partially sighted or blind people to independently enjoy cities like Lucca. After all, we could, some of us, be in the same boat one day… and Handel whose music we’d heard the evening we observed the pavement signs spent his last years in darkness. The Medici dynasty of Florence were not just great art patrons, they were also great science patrons. Nowhere can this be seen better than in one of the city’s most intriguing museums, the Galileo Galilei Museum of science which we revisited on a recent trip to the city. Galileo Galilei, who was born in Pisa in 1564 and died at Arcetri, Florence in 1642 (where there is an observatory dedicated to him) holds a supreme position in science corresponding to that of such figures as Michelangelo in art. Leaning on the manufacture of higher precision lenses from Holland, Galileo was able to construct telescopes which revealed such discoveries as mountains on the moon and satellites around Jupiter (which he named the “Medici” planets in honour of Florence’s rulers). Above all, Galileo was the perfector of our modern scientific method of research which he applied not only to astronomy but also to physics, dynamics and mathematics. The revolution effected by Galileo in kicking out the earth from the centre of the universe and making it revolve around the sun (“e pur si muove” he said under his breath at his “recantation” when the Inquisition showed him the instruments of torture – “and yet it (the earth) moves”) was drummed home to me when I saw the incredibly elaborate model of an armillary sphere by Antonio Sanducci and made around 1590 showing the earth very much in the centre of things. I’m glad to say that the papacy has now apologised in retrospect to the great scientist for the insult and suffering it inflicted on him. Let’s hope that (if there is an after-life) poor Galileo heard their apology. However, for anyone sailing during Galilei’s time the earth had to be the centre of the universe since all positions were worked out by reference to the sun, stars and planets surrounding it like concentric globes. This picture of navigation continues well into the modern age. I visited the museum with a sailing instructor who was able to point out to me the mathematical instruments like sextants and astrolabes used for the calculation of the position at sea for captains and skippers in pre-GPS times. What amazed me was how these scientific instruments were also supreme works of art combining accuracy with elegance. The section on clocks was also fascinating; it should be remember that, although latitude could be fairly easily computed since mediaeval times, longitude depended on extremely accurate time-measuring equipment not available until Harrison constructed his famous chronometer, gaining him a Royal Society award and now on proud display in the Greenwich maritime museum. 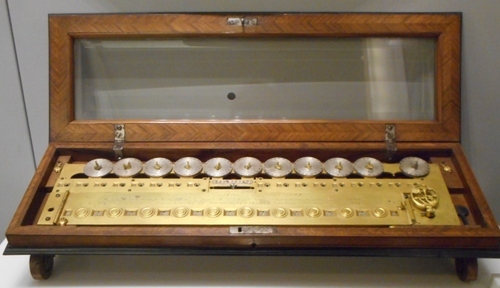 My own interest in calculating machines and computers was aroused when I saw an English development of Leibnitz’s original machine beautifully carried by Samuel Knibb in 1664. I wish my laptop could look so elegant! The field of electricity and thunder flashing inducing equipment produced at the turn of the romantic era turned my imagination to Frankenstein’s laboratory in the lonely tower and the galvanization of his monster. Indeed, science became a popular entertainment and, just as ladies would entertain at the piano, so gentlemen would show off their latest scientific toy. Amateur science was born and moved out of the exclusiveness of aristocratic enclaves. The Galileo Galilei museum, which is just at the back of the Uffizi gallery, is yet another of Florence’s museums which have been expertly revalued and present their wares as they should be presented – with clear and informative displays both in Italian and English. Kids of all ages from 4 to 100 should also enjoy experimenting with the museum’s hands-on section which illustrates various physics laws and clock mechanism. Florence’s Science museum’s web site at http://www.museogalileo.it/ is a supreme example of how it should be done. One can actually visit the museum without having to go to it by experiencing its “virtual museum”. I think however, that the virtual museum serves a double purpose, the second being that of preparing one for a visit to the museum and deciding what to concentrate on there. Writing an effective blog requires verifiable facts and appropriate images; while text files can be easily searched, and desired contents found, photographs can sometimes present a problem. Pre-digital photographs can be scanned and even enhanced. Required details such as whom, when and where can often be remembered and these details added to the digitalised image. Remember, however, in photo properties, to distinguish between the date the image was originally snapped and the date it was scanned and digitalised. With digital photographs the “when” detail is easy as it appears in photo properties, together with any amendments. The “where” bit can be located if the camera is equipped with GPS (as many are today). The “who” part can be performed with a faces search in “Picasa” which presents one with thousands of mug-shots after a search. 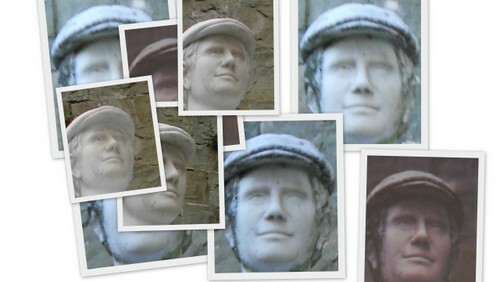 If the face is unrecognizable then the photograph can be expanded to show the context of the face. This greatly enhances one’s memory but, of course, if it’s an unknown face in a crowd not much can be done about recognizing it. Privacy details would, moreover, be involved. I am quite amazed at the “faces” option and its way of recognizing one, whether aged six or sixty. If George Orwell, just before dying, said “everyone gets the face they deserve” then that face comes pretty early in life! Animals also present a problem. Perhaps the search hasn’t reached that stage yet but I’d love to have individual identification of my cats. Everyone’s computer is an electronic archive of one’s life. Again there are pros and cons in this. If one decides that one’s life is interesting enough for an autobiography then the material in letters, emails, photos is there and can sometimes be daunting (especially if one decides to archive them on a separate hard disc). With regard to autobiography I’ve managed to wheedle out Lina Waterfields “Castle in Italy”, written in a completely pre-digital age, from BDL’s library. For me the book is a missing link between the earlier generation of ex-pats in Italy and the current one. If the names Janet Ross, Bernard Berenson, D.H. Lawrence or Kinta Beevor mean anything to you then you will find the book especially engrossing. But it’s also fascinating because it presents life in this part of the world in the first half of the twentieth century when for an Englishwoman to ride a bike through a village would arouse astonishment and where life for several ex-pats would be full of luxuries but none of its necessities. Those who have visited the Fortezza Della Brunella (see my post at http://longoio.wordpress.com/2013/11/15/carinthia-in-aulla/) will understand what I mean. Now let’s go out and get those necessities….